From today, operators cannot charge more than 32p per minute (plus VAT) for outgoing calls, and 10p per minute (plus VAT) for incoming calls. The new tariffs are the latest in a series of annual price reductions forced on the mobile industry by the European Commission. 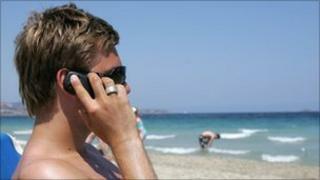 Brussels has said it aims to equalise roaming and domestic charges by 2015. A group of UK mobile operators - O2, Vodafone, Orange and T-Mobile - attempted to challenge the Commission's price-cutting agenda, taking their case to the European Court of Justice. However, their complaint was dismissed in June 2010. Operators are compelled to place a 50 euro (£45) cap on users' data consumption, in order to avoid unexpectedly high bills. Customers who wish to continue their data roaming can request to have the limit removed.